Located right in the home of mountain biking, the Gunnison Valley has much more to offer than your typical mountain biking destination. Comfortable lodging, delicious dining options, and a vibrant arts scene add to the experience. A Colorado mountain vacation in Gunnison-Crested Butte is just what you need to relax and recharge this summer. 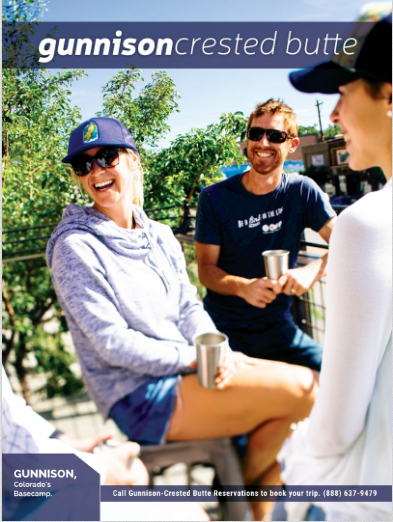 Request your free 2015 issue of the official Gunnison-Crested Butte Vacation Guide today to start planning your amazing summer adventure. Filled with stunning photos, a Gunnison Valley map, and information about lodging, dining, and events in the Gunnison Valley, this is just what you need to make your plans. Use the form below to request the official Vacation Guide for Gunnison, Crested Butte, Mt. Crested Butte, and Almont. You can expect to receive a guide within the next two weeks. If you’d like to view it in the meantime, check out our digital guide online by clicking the picture on the right or click here to download the PDF version. Yes, I'd like the Official Vacation Guide mailed to me. Yes, I'd like the digital PDF version of the Official Vacation Guide emailed to me.